A hoop net can help you have a successful day on the water. For centuries, fishermen have used various forms of hoop nets to catch not only fish, but also crustaceans and other marine life. This style of net, which consists of netting wrapped over a series of hoops, has an open end and a closed end. The trap works when a fish swims into the hoops but is unable to swim back out. Add an identification tag to each trap in accordance with local law. Every state has a ban or strict regulations regarding the use of nets for fishing. The regulations may restrict such things as placement, construction, timing, eligibility and target species. Find a legal spot to place your net. 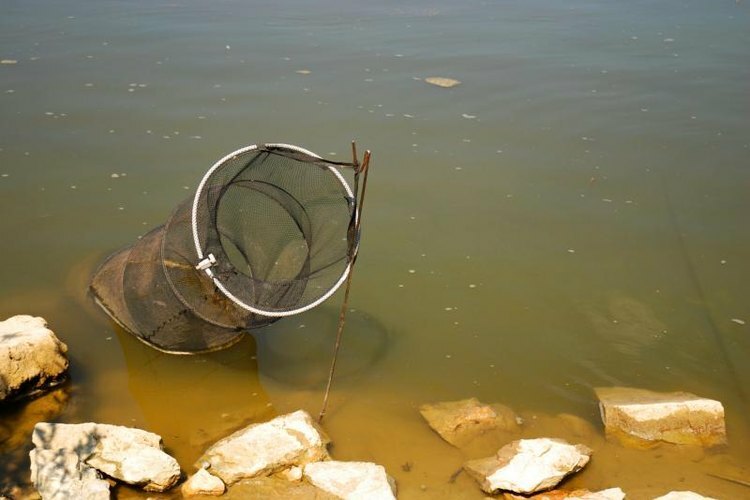 Get the property owner's permission if you plan to place your net next to the bank. Hoop nets are designed to be used in bodies of water where the fish have predictable migration patterns, such as swimming upstream in a river. Place the appropriate bait for the fish you wish to catch in a mesh bag or slotted box attached inside the hoop net near the closed end. Attach a rope loop to each end of the hoop net and tie the net to one or more stakes. Otherwise, tie a weight to each end if the hoop net. If the hoop net will be fully submerged, or if required by local law, attach a rope between each end of the net and a buoy. Follow local fishing regulations to determine how long to leave the hoop net in place. Fishermen often place their nets in the evening and pick them up the next morning, or vice versa. Pull up the open end of the hoop net first. Using gloves, pull up the closed end of the net. When you get the net into a convenient place, release the drawstring on the closed end to retrieve your catch.